The Squad (Merton, London) runs a weekly youth club where learning disabled young people can develop a range of skills and abilities. Over the last three years, RadioActive101 has given young people the chance to not only experience something new, but it has also provided a unique opening for young people’s development. Young people from the learning disabled community do not have the advantage of being able to speak openly about topics that affect them in their daily lives. The radio project has combated these barriers through providing opportunities and support. We have been able to work with over 30 young people on this project, all of whom have developed a range of skills, capabilities and competences, developments that can be seen and heard through the shows. Examples include being given the opportunity to learn editing software, understand interview protocol, develop their voice and become more confident in their own ability. We have worked with so many inspirational people and organisations and so we asked a few to tell us their story. The Nominet Trust supported our work until late 2013 and here is a link to the Nominet Final report on this ground-breaking period of our work. This work laid the foundations for our European project RadioActive Europe (2013/15) to win funding from the Lifelong Learning Programme at the European Commission. Here are some of the young people we have worked with. George is a member of The Squad, a weekly youth club where learning disabled young people can develop a range of skills and abilities. 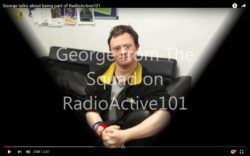 Here’s what George has to say about his ongoing experience of making radio shows with RadioActive101. 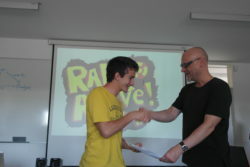 And here’s José Oliveira’s story – José is from Porto, Portugal and he’s pictured here being awarded his certificate for his journalism skills in radio production by Professor Andrew Ravenscroft, Director of RadioActive101. Whatever your interest, we are friendly and inclusive. So if you’re motivated by these stories do get in touch and we’ll find a role for you.